40 Years of Repeated Victories In High-Stakes® Criminal Defense And Tax Defense Cases. 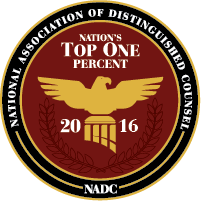 Achieved Exceptional Results In Five Recent High-Stakes Criminal Defense And Tax Defense Cases. Achieved Full Acquittal On Federal Tax Evasion And Conspiracy Charges For A Businessman After A Three Week Trial. The Jury Deliberated Less Than Two Hours Before Entering Its Unanimous Not Guilty Verdict On All Charges. Tax Preparer’s Sentence Was Vacated On Appeal And Remanded By The U.S. Court Of Appeals For The Third Circuit To The District Court For Resentencing. Achieved Full Dismissal Of A Six Count Federal Indictment Charging A Military Contractor With Procurement Fraud. Achieved Full Acquittal By A Federal Jury As To A Ten Count Indictment Brought Against A Physician Charged With Illegally Prescribing Pain Medicine. This Marked The First Reported Major Defeat At Trial On All Counts For The DEA Diversion Unit. Secured Exoneration For A New York City Tax Preparer Who Had Been Designated By The Department Of Justice And IRS As A Target Of Its Criminal Investigation. Successfully Represented Targets Of Federal Criminal Investigations And Federal Tax Investigations Including An Accountant, A Lawyer, A Priest, A Businessman, And A High Ranking Law Enforcement Official. Presented Oral Argument Before The United States Supreme Court In A Major Federal Criminal Case. Only 75 Cases Per Year From Throughout The United States Are Granted This Status. Harvard Law School Graduate Program. Honored As Special Student In Advanced International Legal Studies. Master Of Law In Taxation From NYU's Perennially Top Rated Graduate Law School Program. Mr. Mullin Is An Accomplished Black Belt Martial Artist With An Unrelenting Drive To Secure Justice For His Clients. "Master in Defending the Accused."